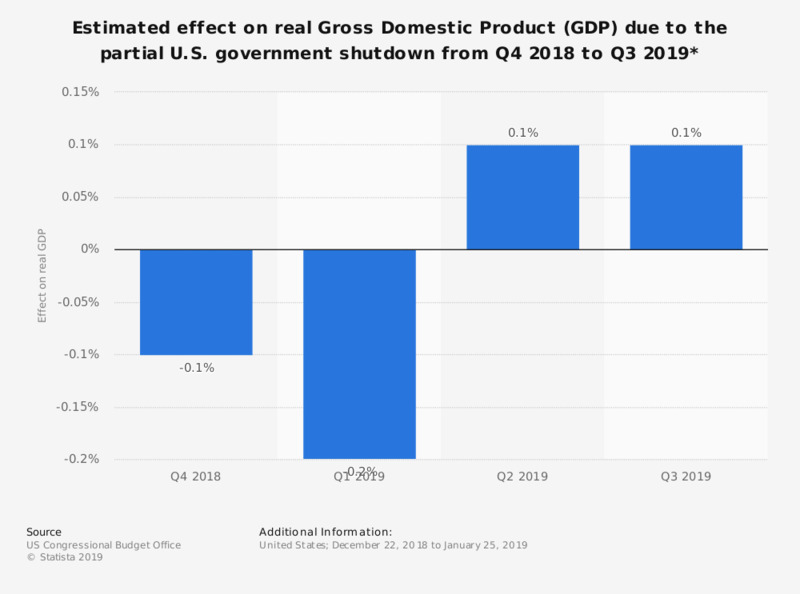 This statistic illustrates the estimated effect on the real Gross Domestic Product (GDP) from Q4 2018 to Q3 2019 due to the partial government shutdown in the United States, which took place from December 22, 2018 to January 25, 2019. During the first quarter of 2019, it is estimated that the real GDP of the U.S. will be reduced by 0.2 percent due to the government shutdown. * Effect on real GDP is an estimation. Do you personally view this shutdown as a crisis, as a major problem, as a minor problem or as not a problem at all? As a consequence of the shutdown, do you feel more negative or more positive toward President Obama? As a consequence of the shutdown, do you feel more negative or more positive toward Democratic leaders in Congress?